One reason liberals today find themselves vulnerable to vituperation from so many quarters simultaneously is the difficulty they face in explaining, even in the most rudimentary terms, their basic philosophical beliefs. While contemporary conservatives may actually ignore their own principles in practice, they can at least explain them. It is a good point. Liberals do have a hard time defining their belief system in comparison to conservatives. Ann takes a good stab at it here with her list of things that she wants. I think part of the difficulty is that liberals have a much more complex and nuanced system than the simplistic and naive belief system of many conservatives. But Alterman hits on what I think is the key difference a little later in the book when he notes that liberals, unlike conservatives, are mostly concerned with outcomes, not the means. Conservatives, on the other hand, are all about the means. For rightwing ideologues, the means are all important. Anti-government, anti-tax, pro-big business, privatization, etc. It is that way or nothing and it doesn't matter whether it works better or not. For liberals, however, we aren't so hung up on the means. We want results. We want a fair, equitable and just society where people have access to healthcare and education and a clean environment and so on. If we can achieve that through small government, low taxes and privatization then that's great! The problem is, as we've seen for the past eight years, it just doesn't work that way. You need government to do a lot of these jobs because it just isn't practical for private, profit-oriented businesses to do them. So you end up with liberals supporting big government programs not because they love big government, but because it is the only means to achieve the things we want and need in America. Meanwhile, conservative stubbornly stick to their means because it is the core of their ideology and if it does not produce the desired results then they just make excuses about how we did not stick to the ideology fervently enough. Some of my conservative friends are appalled when people say that the “surge” in Iraq failed. They think that it is self evident that the surge was a glowing success because of the sharp reduction in violence in Iraq and they get upset with anyone who suggests it was anything less than a miraculous success. So let me try and explain why the surge was a failure using an analogy. Imagine that you are driving a car on some backroad somewhere and suddenly you get a flat tire. Let’s say that the car represents Iraq and the flat tire represents the broken government there. Now let’s say that you don’t have a jack to lift the car up, but fortunately a big, strong kid comes along and offers to pick the car up for you. You are amazed when he walks over and lifts the car in the air. You say “what an amazing thing this person has done by lifting the car in the air” and you rush off to find other people to see this amazing feat. Folks come from miles around to applaud and cheer as the boy lifts the car again and again. Finally, he tires and puts it down and goes on his way. Meanwhile, the tire is still flat. In case you missed it, the big youth represents the U.S. Army at the peak of the surge. Our Army did a wonderful thing by lifting the car or quelling the violence in Iraq, but while we were doing it, nobody bothered to fix the tire, or the broken government that needs to get its act together and take over so that our troops can come home. So that is why the “surge” failed. Because nothing was accomplished while we were flexing our military muscles and now we are tired and can’t continue to surge anymore. 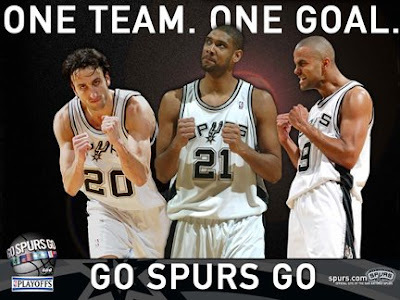 The Spurs have nothing to be ashamed about. They had a terrific season and just fell short of going to the Finals for the second year in a row. Most teams did not make it this far. But they couldn't make it over this last hump. It still hurts to see them lose, but you can't win all the time or else winning would not be special when it does happen. I'm not going to whine because Manu didn't score 30-plus points in every game. He had a great season. Tim Duncan is still playing solid basketball even if he is not the high scorer he used to be. And Tony Parker still has a long career ahead of him. It will be interesting to see how many of the other players will be back next year. Horry will retire. Finley, Barry and Bowen may be sent packing. Same with Oberto and Thomas. Udoka is probably the only one outside of the Big Three guaranteed to come back. We shall see. I'm not sure that breaking up the team is the best option, but they will have to do something to stay competitive in the Western Conference. 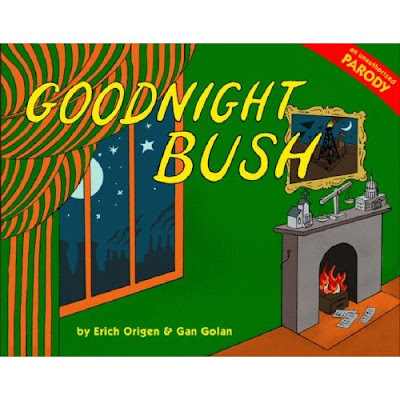 Over at Political Wire I see there is a wicked parody just out that skewers President Bush using the classic children’s book Goodnight Moon as its inspiration. I can hardly wait to get a copy. The original book by Margaret Rose Brown has been a favorite at my house for the past five years.